Was Bill Elder’s 1969 Plymouth Barracuda the fastest thing at our $2004 and $2005 Challenges? Not exactly. Was it a cool, low-buck build? Yeah, pretty much. For power, Bill mixed and matched from the Mopar catalog: 318 bottom end, 360 heads plus a 340 cam, intake and exhaust. Bill did the paint and body work himself, too, conceding that conditions might not have been perfect–it was cold and windy the day he sprayed the paint. “Half the yellow paint is in the Atlantic Ocean,” he told us. Join Free Join our community to easily find more Plymouth articles. It always blows me away when I see a fast 200X challenge car for less than half the price of a roached out version on Craigslist. I still have a picture hanging over my desk of me staged next to him in a Yugo! 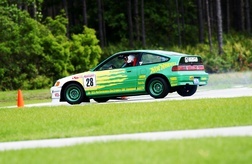 I beat him on the autoX, and gave him a button that said, "I got beat by a Yugo", which he proudly wore to the banquet. 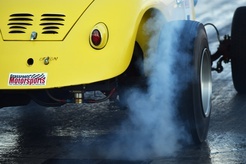 To return the favor, he insisted I give him a shot at me on the drag strip. He killed me. Then he hand made a note which he gave me that said, "I got beat by an old coot in a 40 year old Cuda". The note is framed right next to the picture of us staging. thats cool to say the least. does anyone know what every happend to that car? That was a very clean build. Nothing fancy but a very well sorted car with well chosen, simple, highly effective mods. Dad (Bill) and I (David) still have the Cuda. Haven't played with it much in a while. 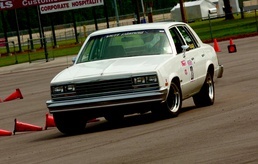 Our other 200X Challenge Car, the Slant Six 64 Valiant with the 4-speed was gifted to former challenger Jason Ernst last year and is being campaigned in the 24 Hours of Lemons as a replacement for the Slant Six E30, which got to be too rusty to race. Miss you dudes! That was one of my favorite cars that year for sure!! !